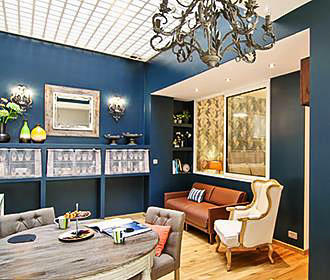 This boutique style B&B is a place where you can enjoy a typical Parisian stay in an historical building with a French breakfast, but also has the added benefit of these being self catering apartments that all have en suites with complementary toiletries, a kitchenette with welcome pack, free WiFi and much more. You will find that this B&B in Paris is located in the 12th Arrondissement within an historical building that dates back over 200 years, which has been fully renovated to add modern touches, but still keeping the original character, although unfortunately there is no lift. 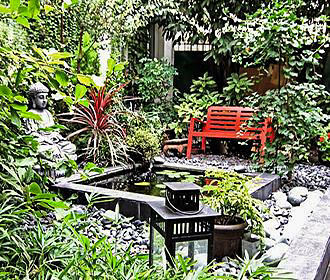 However, you will find that there is a lovely courtyard garden where you can enjoy breakfast during the warmer months, or just relax in this peaceful oasis after a day of business or sightseeing around the city, although on those not so nice days, there is a dedicated breakfast room. Talking of breakfast, My Open Paris offers a traditional French continental style breakfast with a fresh bread baguette and pastries in the form of croissants with accompaniments, along with freshly ground coffee or tea from Mariage-Frere, home-squeezed orange juice and fresh fruit salad, cereals, yoghurt, etc. My Open Paris is classed as a boutique bed and breakfast with fully renovated comfortable rooms that all have high quality amenities, which you would normally find within a 4 Star hotel in Paris or higher, including free international calls and free WiFi, plus an iron and ironing board can be organised upon request. When it comes to the accommodation at My Open Paris, there is an option suitable for your needs, all of which come with an en suite bathroom complete with hairdryer, towels, bathrobes and Clarins complementary toiletries. This B&B in Pairs is also classed as a self-catering B&B, rather like an ApartHotel, as each has a kitchenette, which includes a fridge, stove, microwave oven, kettle, toaster, coffee maker and kitchen utensils, plus a range of welcome products including olive oil, drid herbs, salt, pepper and vinegar, plus tea, coffee and sugar. In addition to these facilities, there is a flat screen TV, radio, telephone with free international calls and free WiFi, so you can easily keep in touch with family and friends back home, along with what is happening in your own country. The first types of accommodation utilise letters spelling OPEN and the first is Bedroom O, which incorporates a bedroom with double bed, bathroom, living room and kitchenette. Then there are three studio apartments at My Open Paris, with the first being Studio P that has a bathroom and kitchenette and either a king size bed or two twin beds depending upon your preference. 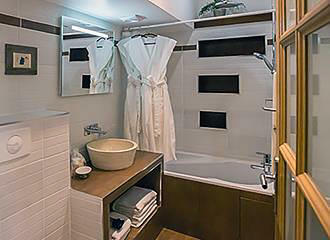 The second is Studio E, which has a bathroom, kitchenette and a comfortable double bed, and the third at My Open Paris is called Studio N, which is the same scenario as Studio P with the option of twin beds or a king size double and all have high ceilings in a traditional style with a fan or portable air conditioning unit available for hot weather. You will also find that this B&B now has a new two bedroom suite located on the ground floor that overlooks the garden, although these can also be booked as individual apartments. The first is called the Ma Symphonie suite, which has a bedroom with king size bed or two twins, a lounge and dining room, bathroom and a kitchen, and the lounge also has a sofa bed for additional guests, plus there is air conditioning in this. Whereas the Studio Papillon has a bathroom and kitchenette, but this means that the ground floor accommodation can cater for up to a maximum of six people. We would like to point out that normally My Open Paris only takes bookings for a minimum of three nights, although shorter stays are possible for late bookings when these are available, and the rates are always based on one to two people with an extra charge made for additional guests. 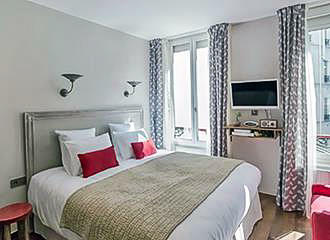 Located in the 12th Arrondissement, this B&B is located in a quiet, safe area close to many popular tourist attractions in Paris such as the Port de l'Arsenal, Place de la Bastille and the River Seine. This also means that there are numerous different options of reaching My Open Paris via public transport in Paris including the Gare de Lyon train station, which serves the RER A and D lines, Intercities, TGV, TER and Transilian train lines. This is also a Metro station for the lines 1 and 14, not forgetting you can also discover the historical Train Bleu gourmet restaurant in Paris located here as well. Alternatively in the opposite direction you have the Bastille stop by the Place de la Bastille serving the Metro lines 1, 5 and 8, or on the opposite side of the River Seine you have the Gare d'Austerlitz serving the TER, Intercities and the RER C line trains along with being Metro station for lines 5 and 10. In addition, if you are travelling by the Paris buses, within a very short walk of this B&B you have the bus lines 20, 29, 65, 87 and 91 along with the Noctilien Night Bus Service via lines N02, N11 and N16, but also within walking distance a little further away are the bus lines 24, 57, 61, 63, 76 and 86 along with the Noctilien lines N01, N31, N33, N34, N35, N134 and N144.